In the late 1980's this image could have been mistaken for having been rendered in tempera or oils, but is actually the result of intense hand work, as though the image had been painted with traditional mediums. This image took second place in an international competition and enjoyed much attention. Although it was actually created in a simple computer paint program about that time, such elaborate detail was difficult if not almost impossible with such tools then. Those were the days when tools such as those found in a relatively few offerings for public use, meant that intricate labor was necessary to achieve believable results. The sophistication for rendering such imagery in those days was mostly in the domain of high-tech corporate or scientific computers. The inspiration came not from some beach scene one might see in a movie or a travel magazine, but from the imagination longing to experience the real thing. The desire to give the viewer the feeling of actually participating in the experience led to the use of the legs in the foreground. 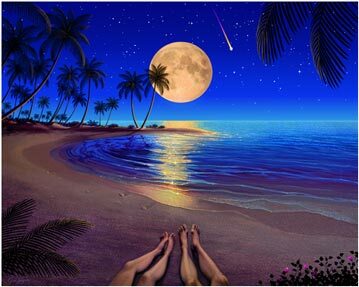 Imagine yourself with a lover or friend looking over your own legs as if actually sitting on this beach. In this unusual perspective there are other details that might be noticed as one looks more closely. The still, clear night offers itself to your senses as you see rich, deep blues that give magical intensity to the horizon that fades upward into the star studded night. The flavor of this scene may draw on one's imagination to ponder what wonders or adventures may lie out there beyond that enchanted horizon. There is the startling appearance of a falling meteor plunging in from the cosmos. There are soft amber tones from the moon dimly illuminating the edges of the darker silhouettes of palm trees and that sparkle on rippling surf. There is also the perfumed fragrance of exotic flowers near by. One may notice a strange bio-luminescence in the shallows of the water, as is common in some tropical environments. The cool textures of the sand also take in some of the moon's moody and romantic light. One might hear music, feel the soft, cool Polynesian breezes that caress exposed skin, hear the wet sound of gentle surf lapping at the shore and bask in the youth that lives in us all.